Coffee Drinkers: Paper Cup vs. Styrofoam Cup? It turns out styrofoam is not as bad as it seems. If you are an environmental advocate, styrofoam might as well come straight from the devil’s kitchen. But don’t be so quick to judge: when compared to paper cups, serving coffee (and perhaps other drinks) in styrofoam is the greener decision. For starters, those extra sleeves which protect your gentle hands from heat create more garbage than polystyrene alternatives. 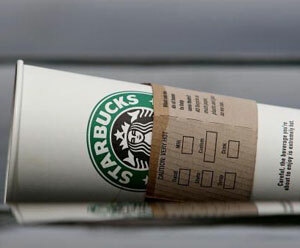 Think about it: styrofoam cups don’t need wussy cardboard sleeves. Even more surprising is that paper cups use more raw materials and energy to produce. Not only that, but they require wood pulp. When all is said and done, paper costs two and half times more than the other cup! If you consider how many paper cups Starbucks must bulk order, you have to wonder if they’ve considered the expense. Of course, some of us (like me) don’t usually drink coffee out of disposable cups. I tend to use the same mug every day. How’s that for eco-friendly?